Chlorine gas is a pulmonary irritant that can cause serious respiratory damage. It was used as a chemical weapon in World War I, and unsuccessful terrorist attacks have attempted to release the gas on American soil. Chlorine gas is incredibly dangerous. If there’s a leak near residential or school zones, there could be a significant kill zone. Accidental release near residential areas would endanger surrounding areas and employees. Disaster preparedness drills are much more difficult and require more training. Scrubber systems (required with chlorine gas) have a tendency to leak when under pressure. While chlorine gas can be more economical, the safety issues and containment challenges pose a greater cost that can’t be measured financially. However, bleach or sodium hypochlorite has its own storage challenges, and it’s important to follow best practices to protect your equipment and employees. 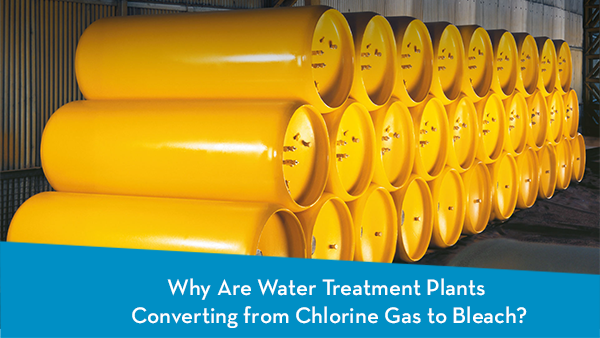 Sodium hypochlorite poses three challenges your water treatment facility will need to overcome: UV rays, off-gassing, and oxidation. Poly Processing has established a set of best practices and containment solutions that overcome these challenges. If you store sodium hypochlorite outdoors, the chemical structure breaks down when exposed to elevated temperatures (above 90°F) and UV rays. You can prevent this breakdown by using a carbon black tank. The black color blocks UV rays and doesn’t significantly increase the temperature of the chemical. For certain climates like Florida or Arizona, it often makes sense to insulate the tank as well. Discuss your specific application with a chemical storage tank expert to determine the right course of action. Sodium hypochlorite typically contains transition metals, such as nickel, iron, and copper. If these build-up in a chemical storage tank, you run the risk of creating off-gassing, which can be dangerous to your employees, your environment, and your tank. The best way to prevent this build-up is with a tank that allows for a full drain. Our IMFO® System provides a 100 percent full drain every time. It’s the only solution in the industry that places the flange at the true bottom of the tank, below the knuckle radius. No other tank can give you this kind of full drain without requiring manual cleanout. Sodium hypochlorite is an incredibly aggressive oxidizing chemical. Using an antioxidant barrier can more than double the life of the chemical storage tank system and help ensure the safety of the tank. Traditional polyethylene tanks may fail when storing an oxidizer, but an XLPE tank with an inner-surface engineered polyethylene system helps protect your investment long term. The OR-1000™ is our next-generation system, and it gives you four times the antioxidant power of a standard tank material. All wetted surfaces, including the IMFO drain, are also covered by this resin, eliminating the risk of a potential attack on the structural integrity of the tank system. 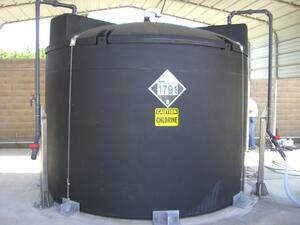 We have decades of experience helping customers to store sodium hypochlorite. We provide the best solutions in the country to store the chemical safely and effectively. Want more information and useful tips? Download our Sodium Hypochlorite Chemical Storage Guide to learn about each component of your tank that you might need.